French toaster sticks are a perfect Saturday morning breakfast! On the weekends, I love making breakfast for my family. They love eggs, pancakes, waffles, and french toast. I don’t make them on busy school mornings so the weekend is a perfect time! The kids are huge fans of these french toaster sticks! Most mornings we eat toast or cereal with some fruit or yogurt. But on the weekends we have plenty of time to enjoy a meal together. Weston is a fairly picky eater but he’ll eat almost any breakfast food, so cinnamon french toast sticks are always well received. Carrigan has been helping me in the kitchen more and more these days so I let her help dip the french toaster sticks before I put them in the pan. It’s an easy way to make a family breakfast together! 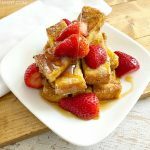 You can make these cinnamon sugar french toast sticks with almost any kind of bread that you have, but the recipe works best with thicker slices of bread so we like using Texas Toast! STEP 1. Slice the crusts off two sides off the Texas Toast. Then cut each piece into three equal sticks. STEP 2. In another dish, mix the cinnamon and sugar together. STEP 3. 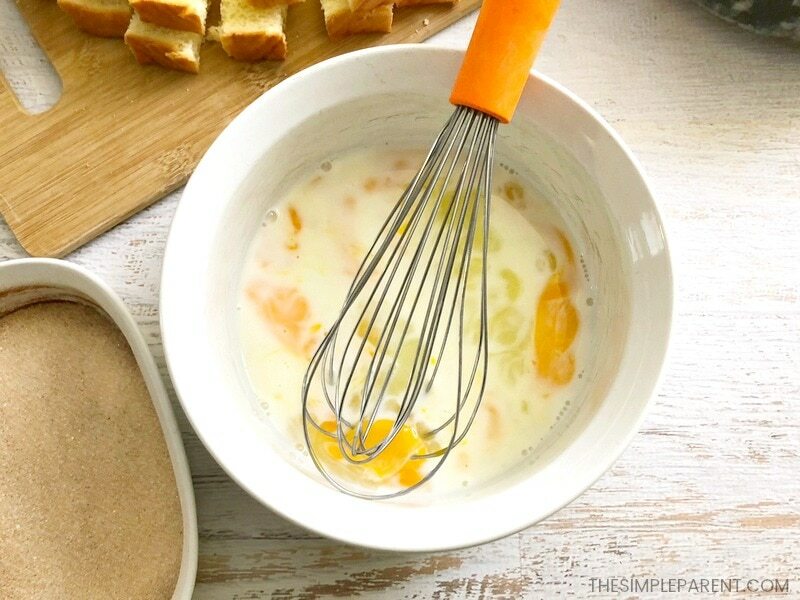 In a large flat bowl, whisk the two eggs and milk until combined. STEP 4. Begin melting the butter in a large skillet. STEP 5. 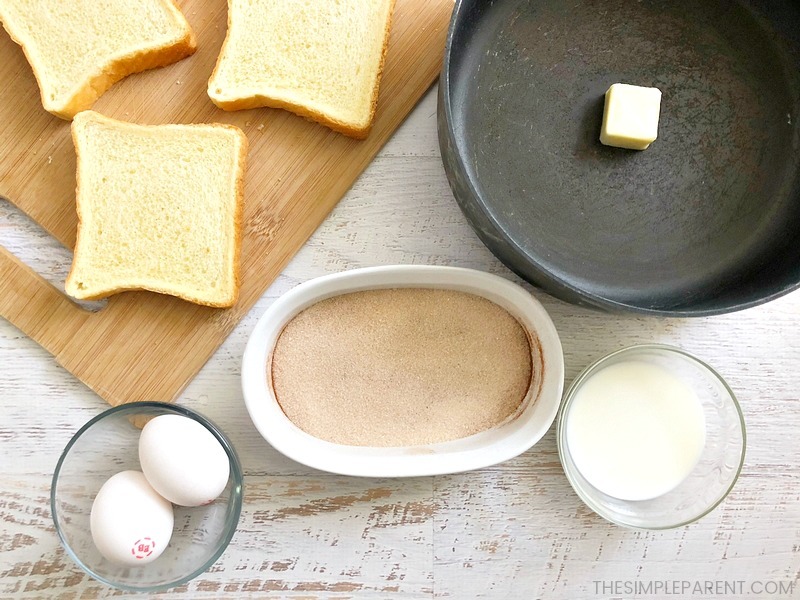 Dunk the pieces of Texas toast in the egg mixture. Let any excess drip off and place about six pieces into the buttered skillet. STEP 6. Cook all sides of the french toast sticks until golden brown. STEP 7. Remove from pan and immediately place in cinnamon and sugar mixture. Coat lightly. STEP 8. Add more butter to the pan and repeat with the remaining pieces of bread. STEP 9. Serve with fresh fruit and syrup! My kids usually skip the fruit because they prefer apple slices these days, but I love to have fresh berries with them. If you want to sweeten them up a little bit more, you can add a dollop of whipped cream! My kids always love that! You can also serve the syrup on the side and let your kids dip their french toast sticks! 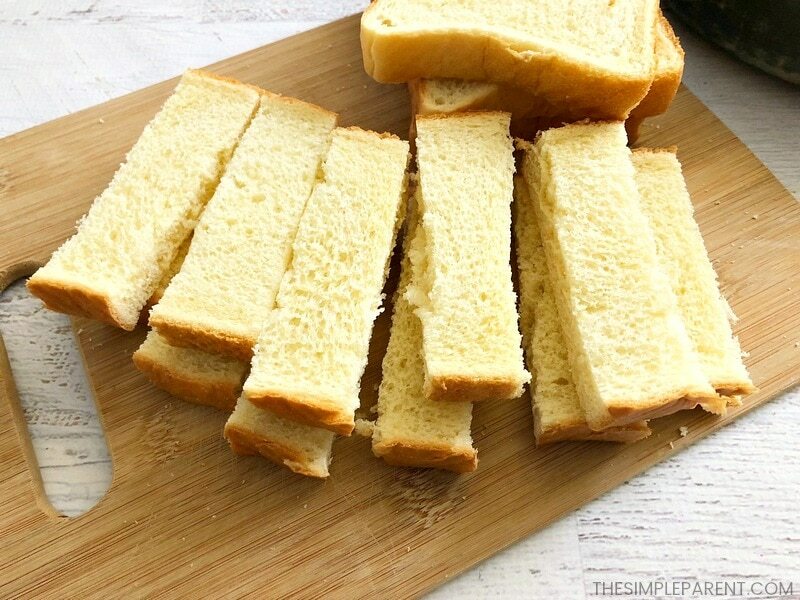 Slice the edges off of the Texas toast and cut each piece into 3 even pieces. Mix cinnamon and sugar together in a dish. In a large flat bowl, whisk two eggs and milk until combined. Melt butter in a large skillet. 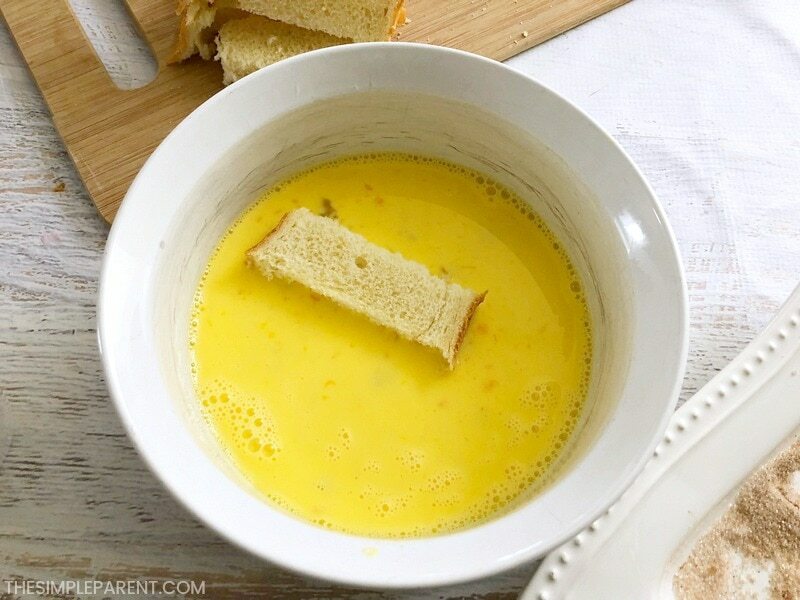 Dunk each piece of bread in the egg mixture, let any excess drip off and place about 6 pieces in buttered skillet. Cook all sides until golden brown and immediately dunk in your cinnamon and sugar mixture. Add a little more butter to the pan and repeat with remaining bread pieces. Serve with fresh fruit and syrup. 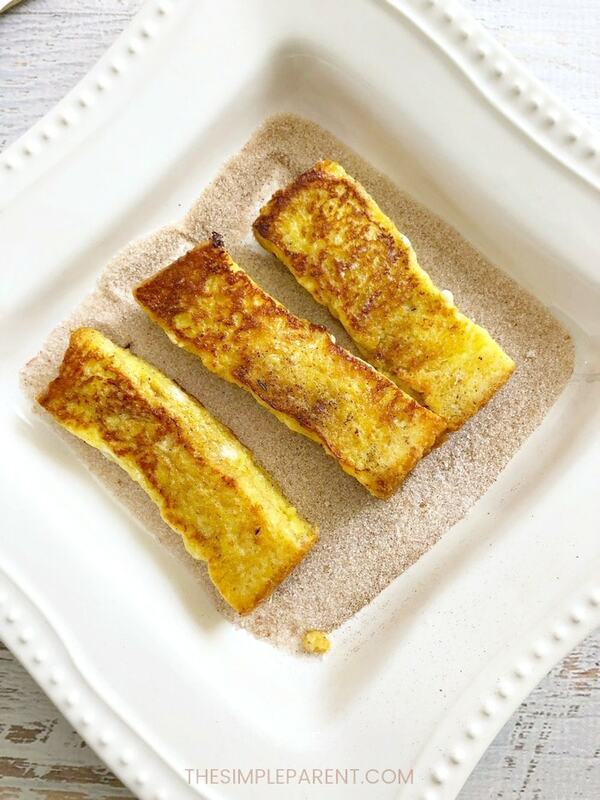 The great thing about these french toaster sticks is that they’re easy to turn into cinnamon french toast bites! 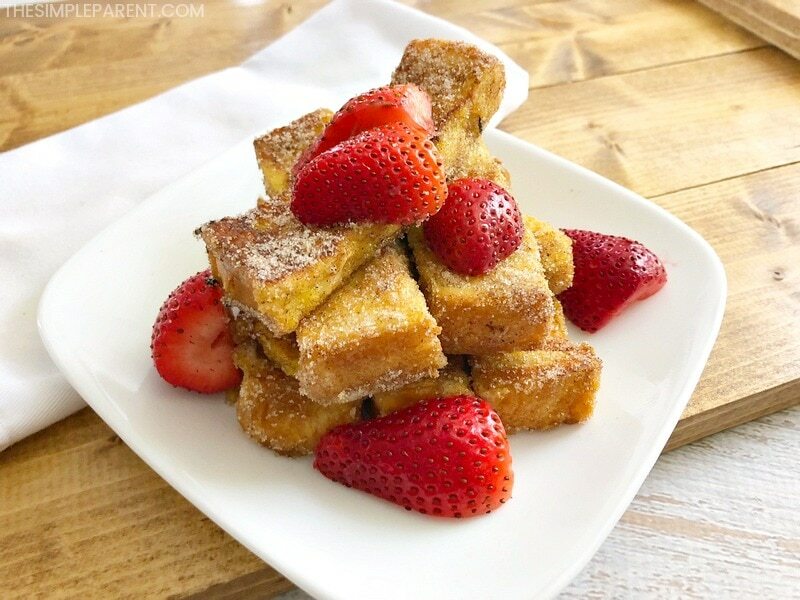 My kids love the store-bought french toast bites so it works well for us. I happen to think homemade french toast tastes a lot better than anything you can buy at the store! 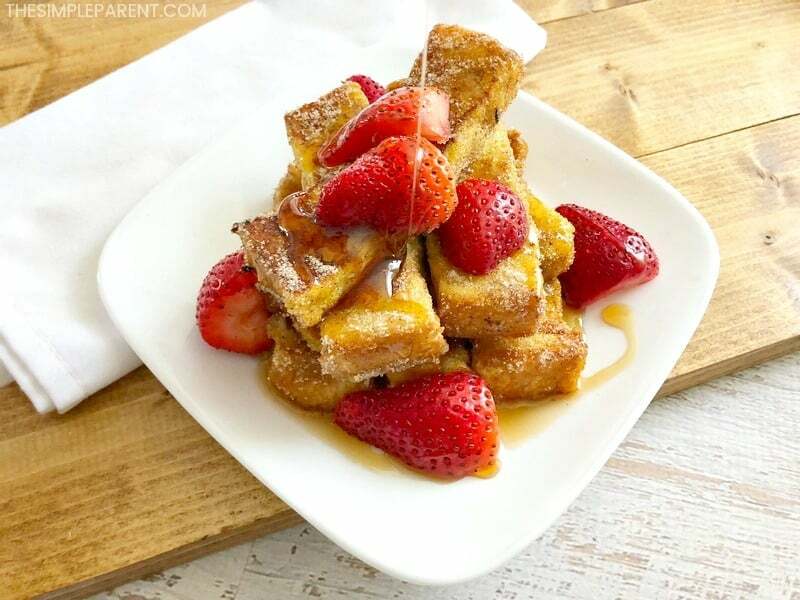 If your family loves breakfast together (especially french toast), be sure to try our Copycat Cracker Barrel French Toast recipe! 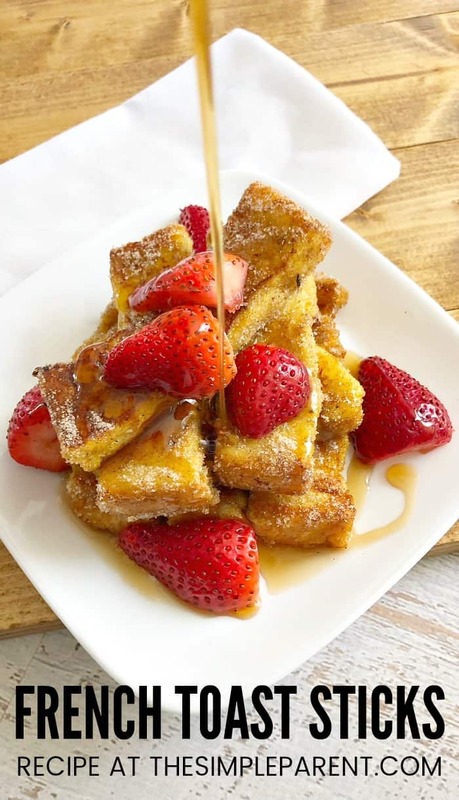 For another take on french toast, we also like the baked french toast recipe here!